The simple truth is PC and console gaming chairs are quite distinct, but the differences can be confusing, especially newbies. In this article, however, we’ll highlight the most important factors you should consider when trying to decide between PC and console gaming chairs. PC and console gaming chairs have a distinct physical appearance. You’re probably already familiar with PC chairs, because they resemble the high-back executive office seat on casters. On the other hand, the console gaming chair features a bulky design that often rests directly on the floor. Console gaming chairs come in two different types, the rocker and pedestal chairs. The rocker’s base rests directly on to the floor and enables the gamer to rock back and forth easily. The pedestal seat looks like a combination between the rocker console chair and a PC gaming chair to raise the gamer off the ground. While the PC gaming chair offers a better posture for extended gaming and the obvious choice if you’re sitting at a desk, the console seat design is arguably a more comfortable option when you’re not constrained to a desk. And as comfort is key when choosing the right chair, let’s dive into that a little more. Both the console and PC seats are designed with the gamer’s comfort in mind. They are well padded especially on the armrests, head, neck, shoulder and lumbar regions. This provides ample support and cushioning which ensures no matter how hard you game, you won’t suffer from undeserved neck, head, back, shoulder and arm pains. However, as alluded to above, the design of the console gaming chair is more about comfort than correct posture. Get This Devoko Ergonomic PC Gaming Chair for Only $89.99. That’s Over 65% Off Standard Price. The PC seats are designed to be higher, allowing the gamer to sit with his legs angled at 90 degrees and the torso upright. While can decrease your comfort level from say a 9 to a 6 out of 10, good posture matters. It keeps your bones in proper alignment, helps your joints, prevents muscle fatigue, and prevents back pain. So even though console chairs are more comfortable, comfort isn’t everything. When it comes to gaming, adjustability matters. PC gaming chairs offer a number of adjustability options including retractable armrests, adjustable headrest, and backrest rigidness. The angle of recline can also be adjusted from 90 to 180 degrees. The console gaming chair also offers great customization options including retractable armrests as well as an adjustable headrest and backrest. It also has 90 to 180 degrees angle of recline, but it provides more balance and support when going completely horizontal because of it’s low profile and solid base. PC gaming has fewer prerequisites regarding gaming devices as you only use your computer, controller, and audio output devices. This means that the PC gaming seat is only a part of your gaming experience in so far as you’re sitting on it. It is rare to find a PC gaming seat that has additional attachments that are connected to the gaming devices. In contrast, console gaming can be more demanding regarding gaming devices. As a result, manufacturers have tapped this power into the console gaming seat by incorporating extra features into them. 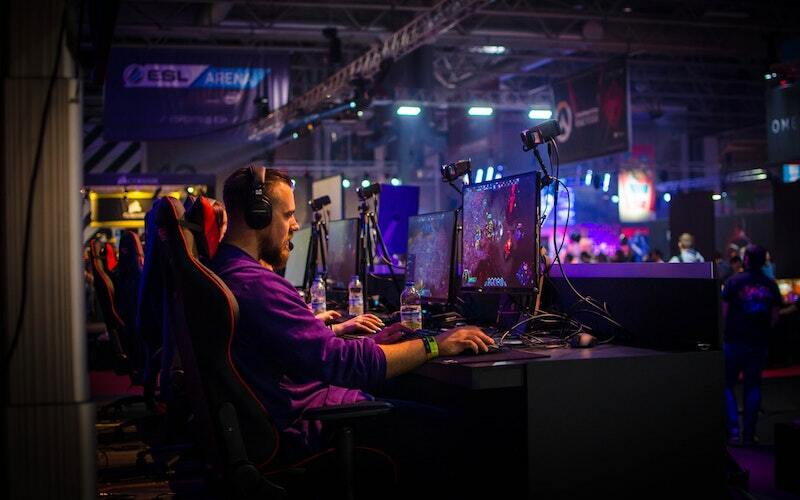 Console gaming chairs come equipped with built-in speakers, connection ports, vibration technologies, wireless connectivity and speaker ports, all of which are compatible with most gaming equipment. So in terms of compatibility, the console gaming chair has the lead while PC chairs bowed out of the race because they can’t compete. The size and bulkiness of these gaming chairs should be a consideration as well. Since the PC gaming chair takes the design of an office chair, it’s designed for smaller areas and takes up less space. Console gaming chairs, on the other hand, tend to be bulky and take up more floor space. After all, they were designed for your entertainment room where space is often less of a concern. The bulkier design of console chairs also makes them heavier and less portable than PC gaming chairs. So if space is a sticking point (often so much so that the chair has to be moved out of the way regularly when not in use) taking these chair designs at face value may lead you towards the PC side of the spectrum. But sometimes, storage options are built in. Every single day, manufacturers across the globe are coming up with imaginative space-saving ideas and designs for their products. This is no different for gaming chairs. Console gaming chairs often come equipped with excellent storage options. First, some of them come with a foldable design for easier storage. Unfortunately, for PC seats, foldability is quite a challenge. Regarding offering storage space, console seats come with storage pockets for peripherals such as headsets, cables, controllers, and batteries among others. Others such as the X Rocker Triple Flip Chair offer a large storage space below it, which can be accessed by lifting its sitting surface. Contrarily, PC gaming chairs do not provide storage space as PC gaming requires less stand-alone equipment. It’s clear that console gaming chairs come with more bells and whistles designed specifically for gaming, as opposed to their PC counterparts. What’s also clear is that each has it’s own benefits depending on the type of gaming and the environment you are accustomed to. If you game primarily on a PC, then go with a PC chair. However, if you are a console gamer or you already have an effective desk chair, then the console chair is going to give your game the greatest boost. For more info on PC and console gaming chairs, their differences, and their purposes, check out this guide.